Experience the making of the Divergent movie in this lush, oversize volume featuring more than a hundred and fifty full-colour photos from the film, including many that have never been seen before. Also featured are illuminating interviews with author Veronica Roth, actors Shailene Woodley, Theo James, Miles Teller, director Neil Burger, co-screenwriter Evan Daugherty, and more. Discover what inspired Veronica Roth's book Divergent, and follow its journey from national bestseller to a spectacular action-packed film that simmers with tension, suspense, and romance. Bringing to life the cinematic world of Divergent required the vision of producers, writers, directors, actors - and countless behind-the-scenes talent who transformed the pages of a book into a remarkable visual experience. These collaborators breathed life into every detail of this dystopian world - creating not only the Dauntless Pit, the Erudite Headquarters, and the Abnegation village but most of all its extraordinary inhabitants. Costume designers' sketches and 3D concept art are just some of the visual treats in this insider's look at the making of the film. I did have high expectations for this movie companion because after the book and film being so awesome, it was only logical that the companion book should be, too. Luckily, I wasn't disappointed. Pages and pages of pranks pulled on set, interviews with cast and crew, and vibrant full-colour photo spreads fluttered before my eyes as I devoured each and every page, careful not to miss a single sentence. My only slight complaint is that there were no surprise pull-outs or pieces of merch inside, like in Harry Potter Film Wizardry, the movie companion for the Harry Potter franchise. I'm not comparing the two films, but the Harry Potter companion had posters, leaflets for shops on Diagon Alley, the long-awaited letter from Hogwarts, and even a full-size Marauder's Map. 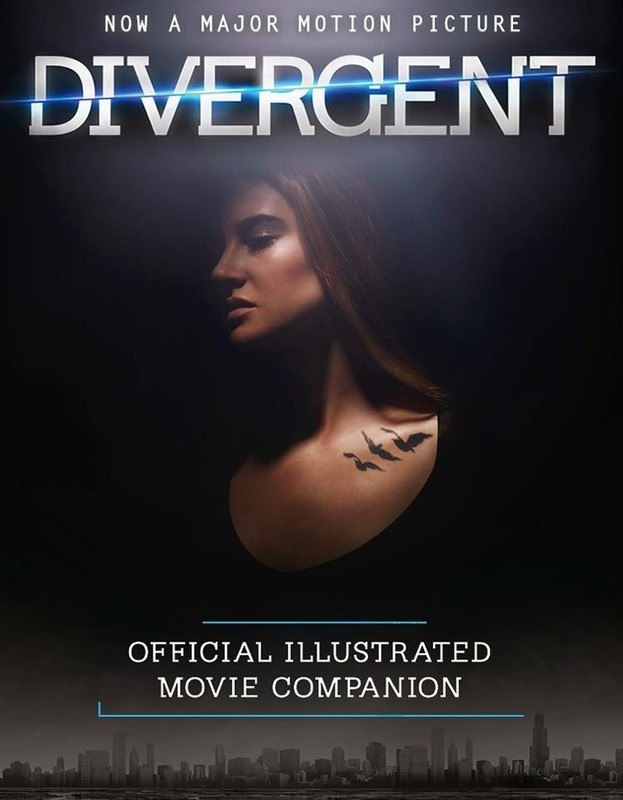 How cool would it have been to have some Divergent goodies enclosed in the book? Very. I have always found movie guides and companions interesting to read and to look at. My passion used to be acting, which I did for a few years but eventually decided to try out working behind the scenes. I don't do that anymore either, but looking at pieces of set and seeing green screens in use still fascinates me. I love seeing how my favourite scenes in a good film were pieced together, such as one of the first scenes in Divergent where Tris takes her aptitude test. If you want to see how that particular scene was created, you can watch a one-minute video here. Anyway, back to the book - it was brilliant for catering to my every film-geekery need. Needless to say, I loved it! Explore the world inside Divergent. Filled with exclusive photos, Inside Divergent explores the meaning of each faction in Veronica Roth's dystopian Chicago: Abnegation, Amity, Candor, Erudite, and Dauntless. Meet the initiates through their candid photos and profiles: Tris, Caleb, Molly, Christina, Peter, Al, and the others. The faction leaders are here, too: Four, Eric, Max, Jeanine, Natalie, Andrew, and Marcus. Follow the journey from the aptitude test to the Choosing Day Ceremony, then fall into the Dauntless Pit and witness the rigors of life in the Dauntless compound. Inside Divergent is a thrilling glimpse into the initiate's world. I'm sorry to say that this book was nowhere near as good as the movie companion I had read previously. 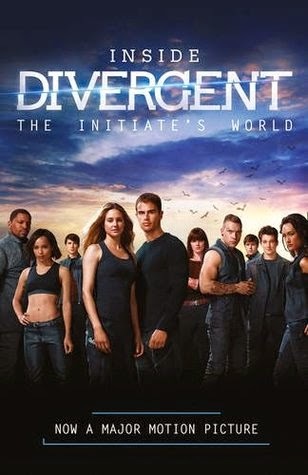 I hoped that Inside Divergent: The Initiate's World would cover some of the more unusual and lesser-known things surrounding the world of Divergent, but everything the book included could be figured out with a little common sense anyway, whether the reader had read the trilogy or not. The perfect word to describe this book is...basic. Inside Divergent describes the factions: what they're for, what their traditions are, and what the members of each faction wear. It also includes character profiles and explains a couple of key points in the plot. I knew all of these things already, and overall it was very simple. I can see this book might be good for someone who wants to know what happens but doesn't want to read the books, or for someone who watched the film/read the book and ended up confused, but it's certainly not a must-have for anyone who is already a fan. Something else which irked me was the stiff, unnatural writing. I'm not very good with words or grammar as you have probably already noticed, but it's annoyingly noticeable when it's someone else's writing, and I have higher expectations of published writers. Long story short, it was too wordy. A lot of it seemed unnecessary, and therefore I ended up struggling to keep my attention on it. The only reason I am giving this 2/5 and not less is because the layout and photos are amazing. I'm a big fan of well-designed books as you already know. But in conclusion, Inside Divergent is flat, dull, and overly repetitive. Imagine someone is reading a 1000-page Algebra book to you in a monotone voice for an hour. Every once in a while you're forced to rub a cactus over your eyeballs. That's how it felt reading this book - it's non-fiction, but that doesn't mean there can't be any emotion or humour. You and your bookshelf can easily live without this book. Rub a cactus over your eyeballs... I love that, ha!! Cacti references ! Yea! After Allegiant I felt very unconnected from the Divergent books.